Newborn (0-9 Months) - £28.99 Infant (6-12 Months) - £28.99 Only 9 left! You know your little girl is super. Just look at those cute cheeks, how could she not be? But have you ever thought she might be a superhero too? She is incredibly strong, lifting herself off the floor, hoisting her toys in the air only to drop them on herself and not get hurt. 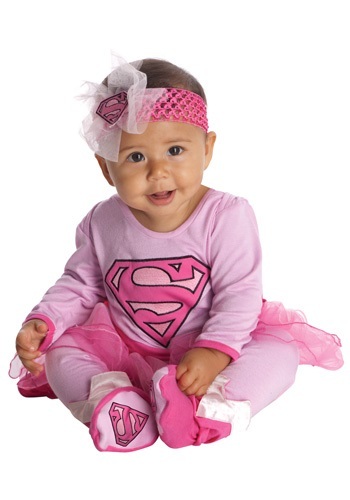 Diana Prince was a baby once, and look how she turned out. We’d say she was a fantastic superhero. Heck, she seemed to be the only one who could keep Batman and Superman from fighting. But now she needs a little help. She doesn’t want to be the only woman who fights crime, she has been doing it for a long time. She just needs a little break. That’s why she had us hold this Supergirl Onesie for some special girl. And we think we found that super girl. Your baby will be learn to fly after you put this onesie on her. You won’t be able to stop her from picking fights with guys twice her size, but while she is small she is mighty. As long as you teach her that she is. Diana knows what your little cutie pie is capable of, and so do you. You just have to let your little girl figure out that nothing can stop her, not even Lex Luthor, as long as she believes in herself! We accept no responsibility for her flying around and going number two though, we just held the onsie, it's your job to make sure she doesn't do the doodoo all over the house.